Will we be able to feed the estimated 9 billion people living on Earth in 2050? The answer may be yes, reports NewScientist. Well that’s according to a new food sustainability paper out this week. The findings are the result of a five year joint modeling project by two French national agencies: INRA (French National Institute for Agricultural Research) and CIRAD (Agricultural Research For Development). The aim was to see how 3000 calories per day per person, for 9 billion people, could be achieved, including 500 calories per person from animal sources. The team ran a global model repeatedly, with and without environmental limits on farming. The upshot seems to be that we will need to counter excessive fluctuations in food prices so that imports in some regions (that will need imports) are not hindered, even if local food production rises. Another main finding is that “the rich must stop consuming so much” food. It is pointed out that around 800 food calories per person per day is currently lost as food waste in the wealthier nations. 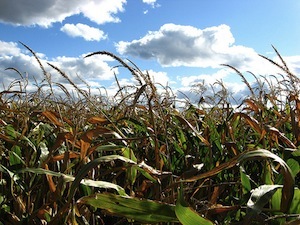 The study found that yield increases could help to feed 9 billion people, even as farmers take measures such as cutting down on the use of fossil fuels in industrialized farming practices. The key will be to come up with different solutions for different regions of the world. Industrial high-yield farming currently means large areas of one crop. This is causing quite a few problems, including crop diseases and the overuse of pesticides. The researchers suggest that ways need to be found to raise yields at the same time as maintaining biodiversity. No easy task. Food sustainability problem solved? Well not quite. Easier said than done. The researchers also suggest that food scientists will need to organize globally, the way climate scientists have done. Not that the climate problem identified by climate scientists is well on the way to being fixed yet or anything. What are your thoughts on being able to solve the problem of being about to feed 9 billion people in 2050? Many of us will still be alive by the way, it’s now less than 40 years away. I’ve also heard a stat that said around 40% of all food in Australia is ‘thrown away’! If it’s correct, its way too high. Sure is! As you know, I have 2 little kids (1yr and 3yrs) and admittedly, the amount of food that ends up on the floor after being sometimes painstakingly prepared is shocking. We don’t have a dog to hoover it up either. It seems unlikely that in a resource depleted world we will be any better at sharing food equitably. So there will -unless we become “better” people- be more starvation and suffering than now, not less. Under what conditions might food shortage for the poor end? Only if there are far fewer people I suspect. Or if there were fewer poor people, as a percentage of the world? Working to lessen poverty may be part of the answer. Less poverty, more education – which could also lead to a more stable population. Is that too much of a Utopian dream that will never happen? We’ll see. I think, we’re heading for a great global disaster.